Today most of the men have their own tool-kits in their homes. Having to rely on the technicians for everything is really a troublesome affair. Thus, possessing a toolkit really makes things much easier for you. However, out of all the things that you can have in your toolkit; a screwdriver set is the most important. Gear-wrench is a highly popular company manufacturing premier mechanical tools for home and industrial usage. Thus, you can easily rely on their craftsmanship. This screwdriver set is unique and very ergonomic. Every screwdriver in this set comes with a tri-lobe handles which provide you with better grip and make the work easy for you. Furthermore, each screwdriver is equipped with a speed zone which helps you to turn quickly even in case of lower torque applications. The screwdrivers in this Gear-wrench set offers you the enhanced access with the help of black oxide non-slip tip by making good contact with the fasteners. The tri-lobe handles provide you with better grip and enhanced strength. 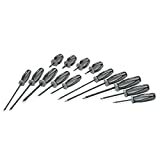 These screwdrivers have a definite speed zone which helps them to even turn quickly in low torque appliances. The shafts are made from vanadium steel which makes them highly durable and powerful. The DEWALT DWA2T40IR screw driving set has been manufactured for the most daunting works. Be it a professional technician or a DIYer, this screwdriver is really an asset for everyone. The bits are all impact ready thus they provide precision, dependability as well as power to perform even the most critical jobs. The set comes with bits of different shapes and sizes which will help you to face any situation without worrying. The set comes with most dependable, as well as durable bits, which are perfect for even the toughest jobs. 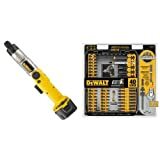 This DEWALT DWA2T40IR screw driving set has a wide variety of tips to embark upon any kind of job. It comes with a 10x magnetic system of screw lock. Also, the FlexTorq helps the bits to increase their flex up to 15 degrees. The bits are highly powerful, durable and come with an assurance of long life. With this set, wobbling, as well as drops, can be easily minimized. Ford is one of the most recognized brands around the world. The company does not only specialise in manufacturing beautiful sedans but it also has their own range of tools. The tools that Ford manufactures come with the highest assurance of quality and premier craftsmanship. 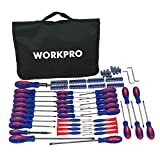 As the name suggests, this Ford 18-piece screwdriver set comes with 18 screwdrivers of different size and shapes to help you to tackle any kind of job. The handles are three-sided as well as highly ergonomic; thus it provides you with enough strength to get your work done easily. The set comes with 18 screwdrivers of most convenient sizes and shapes. The screwdriver shafts are manufactured from S2 steel to make them much more durable. The handles are tri-lobed and highly ergonomic to provide a better grip as well as strength. The tips of the screwdrivers are magnetic. Oria screwdriver set is really a special one since it comes with 76 bits of different shapes and sizes. The bits assure you about providing highest level precision and durability. Furthermore, the bits are manufactured from CRV steel which adds strength and longevity to them. Thus, the screwdriver set is not only perfect for DIY works but also the toughest jobs in the sites. The screwdriver set comes with 76 bits of different sizes and shapes. Being manufactured from CRV steel, these screwdriver bits are highly strong and durable. The driver comes with a unique as well as ergonomic design. High precision and efficient performance are two things that this ORIA screwdriver set offers. Perfect for a wide range of works. 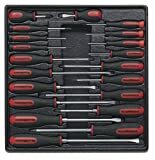 The Craftsman Extreme Grip screwdriver set comes with 14 screwdrivers of various sizes. The screwdrivers are very light in weight and provide fast turns as well as utmost precision. Moreover, the tips are diamond coated; thus they provide better friction and performance in contact with the fasteners. The set comes with 14 screwdrivers of different sizes. The handles have an ergonomic design which increases the strength with every turn and provides better grip. The tips of the screwdrivers are diamond coated which offers better friction as well as utmost precision. The screwdrivers are highly durable and provide efficient performance. It is really a beast! With this screwdriver set, you will never have to fear any fastener. The TEKTON Everybit Ratcheting screwdriver set comes with a complete collection of every kind of bit which you can think of. So, no matter what project you are working on; you will never have to worry about anything. The TEKTON Every-bit Ratcheting screwdriver set comes with 74 piece project and repair bits, 34 security bits and 27 precision bits. Thus, you will be able to tackle any fastener irrespective of its type. The security drives can fit into any fastener that is resistant to tampering. 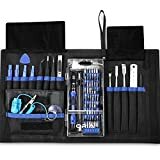 This screwdriver set has been specially designed for repairing mobiles, computers, gaming consoles, laptops and much more. 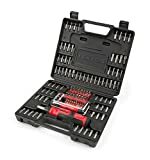 Here is another Craftsman screw driving set in our list. This set comes with 41 screwdrivers of various sizes as well shapes. These screwdrivers offer precision, excellent performance and help you to deal with any kind of work. The handles have an ergonomic structure which provides a better grip. It comes with 41 screwdrivers of different shapes as well as sizes. Apart from slotted Philips screwdrivers, the set also comes with 10 magnetic bits and a driver. Provides precision and efficient performance. The set comes with a lifetime warranty so there is nothing you need to worry about. This Klein Tools screwdriver set comes with 6 Philips tip screwdrivers of different sizes. These screwdrivers help you to get on with any kind of work. Be it professional work or repairing any home appliances, these screwdrivers will provide you with the precision to get all works done. The set comes with 6 Philips tip screwdrivers. The handles offer great grip and strength. These screwdrivers are highly durable and offer utmost precision to do any work. This Workpro screwdriver set is really a work of art. It comes with 130 pieces of screwdrivers of different shapes and sizes along with a plethora of screwdriver bits. The handles are injected with double colours which help to maximise the torque. Above all, the shafts are manufactured from CRV steel thus it provides maximum durability. The screwdriver set comes with 130 screwdrivers as well as several magnetic bits. All the shafts are manufactured from chromium vanadium steel to provide maximum durability and strength. Double colors are injected in the handles for maximizing the torque. It comes with the assurance of maximum precision. A zippered carrying bag is provided along with the set for making it easy to carry. 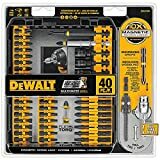 This one sits atop our list; so you can understand that this DEWALT screwdriver set is the best one you can buy. It comes with a 7.2V CRDLS screwdriver and 40 pieces of 10x magnetic bits. It reduces the drop and wobbling. Thereby, you get maximum precision and the strength to deal with any situation if you have this screwdriver set. The screwdriver is obviously 7.2V CRDLS. This DEWALT set comes with 40 bits of different sizes and shapes. It also comes with 10x magnetic locks. The set is very easy to use since it reduces drops as well as wobbling. 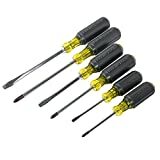 Every screwdriver set mentioned in the list above is exceptional and unique. So, go through your budget; understand which one you need and make your choice wisely.